After a few seasons of promotion and improvement the Ladies team has made it to the Premier Division. 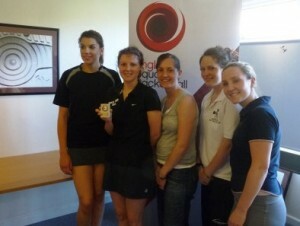 Played at Nottingham Squash Club it was the top 8 teams in the country playing off in a Monrad style event. Team – SARAH BOWLES, SAM WARD, SARAH OSWALD, KAREN HERON and CATHERINE BROWN(BOWLES). First match effectively a quarter-final was Kent, it was to be a very impressive 4-1 victory making it through to the semi-final and already securing the teams place in the top 8 for next season. The Semi-final was to be a very close and controversial match against Yorkshire. Catherine Bowles and Sarah Oswald secured early wins to get into a 2-0 lead, next on was Sarah Bowles at one and Karen Heron at 4. Sarah lost 3-1 but is was the 4th string match where the controversy was. Karen led 2-1 and had match ball against Andrea Santa-maria when there was what seemed to be a certain stroke to Northumbria as the ball hit Andrea as Karen tried to hit the ball, this would of secured a final place but the referee didn’t see this and gave a let, Yorkshire went on to win that game and the match and despite a very close 12-10 in the fifth match Sam Ward wasn’t able to win at number 2 , Yorkshire made it into the final. The team felt robbed. On Sunday there was a 3/4 play-off with Cheshire which was lost 4-1 so it was to be a 4th place finish.